A cheap telescope can discourage anyone from pursuing the astronomy hobby. Usually the effect of lowering the price of a scope is associated with compromising its performance. In many cases the vendor includes additional features that intend to attract the buyer and have no real value. The point is that if the main features of the scope such as the quality of the objective and the focusing mechanism are acceptable we can deal with the rest and make improvements. All the tips and modifications described here are common knowledge to experienced amateurs. A fresh user may find this information helpful in evaluating and using her/his own instrument. I also demonstrate how to make a finderscope out of a small set of binoculars and how to use discarded lenses to make your own eyepiece. Some of these modifications are shown in the photo. I bought this small scope as a department store offer of LIDL in Athens a few years ago for 70 Euros (the current internet value is about 150Euros). I found a lot of reviews and modifications for it, coming from Germany, Austria and England although for a different equatorial mount with a counterweight. 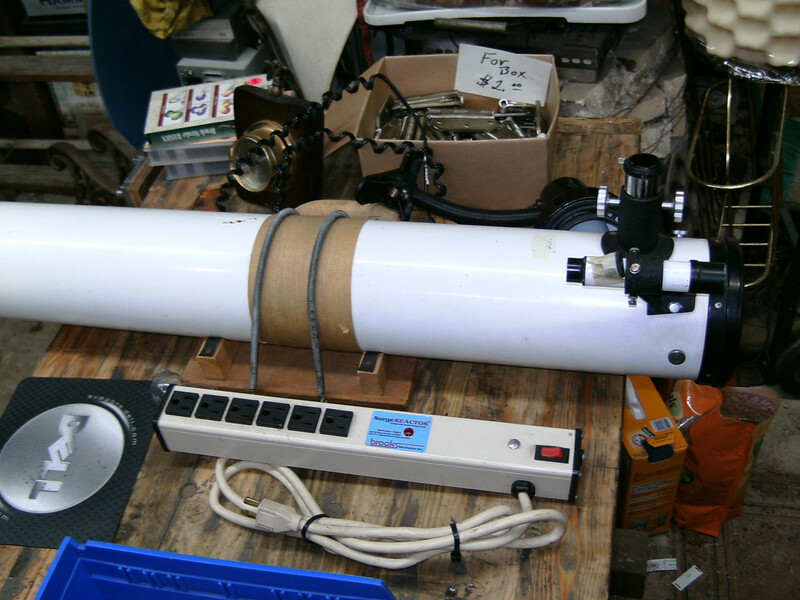 This scope has been included in a comparison test for 70mm refractives in the BBC edition "Sky at Night " November 2010. 1. Light weight, it will go anywhere, the biggest advantage. 2. The objective is good. I tested the field of view with a Celestron 8-24mm zoom eyepiece and the result was about 90%. 3. The 20mm and 12mm eyepieces are usable. 4. The focusing mechanism is acceptable. 5. The tripod works both as an Alt-Az and Equatorial. This is useful as well as instructive..
1. The viewfinder is not too secure on its holder but this can be dealt with. The viewfinder's lenses are plastic and diffuse light. 2. The 4mm eyepiece is inevitably of very low quality with plenty of distortion and chromatic aberrations. This was included in order to advertise 175x magnification. A 2x Barlow lens for use with the 12mm eyepiece would be preferable but I suspect that at this low price the Barlow would not be good either. 3. The tripod tries to do it all but there is a cost. It is too light and unstable. Even a weak breeze will make the scope tremble. The guiding system that supports the scope is well designed and well made. The main source of instability are the legs of the tripod. Hanging a weight makes the whole system more stable. 4. The set included also an orthoscopic tube with a plastic lens in order to turn it into a spotting scope. To be discarded. I use a 45 degree prism instead. You may use a scope of this size and type to observe the planets (zones on Jupiter and satellites, the phases of Venus, Saturn, Mars), the moon, nebulas, clusters and double stars. The theoretical minimum feature size that a 70mm objective lens can resolve is ~2 arcsec. To compare with, the apparent size of Saturn is 15-20 arcsec. Saturn with this scope appears as an oval shape , no chance of seeing more features. I also have resolved double stars distant 8-10 arcsec apart, provided their magnitude is high enough. For example Mizar A (magnitude 2.25) and Mizar B (magnitude 4.0) in Ursus Major , distant 14.5 arcsec is an easy target. Everybody's favourite Albireo in Cygnus (35 arcsec) is even easier to resolve in its two colourful components. 1. Keep your hands away from the main objective lens ! Whatever you do, don't mess with the main objective lens and the buffers in the tube. You may cause a misalignment that you may not manage to repair. Keep the objective always covered when you are working on the tube. This is important. After making a change you may find that it worked better before, specially if you do not have much experience. All changes proposed in this instructableare reversible (with the exception of the box modification). When replacing small parts e.g. screws and nuts always keep the old ones. Buy things that will be also useful for other scopes such as eyepieces and optical add ons . Think always in terms of added value. 4. Build the more you can ! Making things is a part of the hobby of amateur astronomy and one of the major motivations to get into it. The finderscope can be a cause of frustration. This specific one is a 6x25 (6 times magnification , 25mm objective diameter) which will do. It is supported with three screws, one of them containing a spring. The view through it is rather disappointing because the objective is a plastic lens and diffuses light too much, however it is usable as a finderscope when you focus on a bright star. The major problem is that if you loosen two of the screws to align , it may slide in its holder and this can be a problem in the middle of the night. I used two zip ties to restrict the movement along the tube and also mounted a piece of plastic foam on the body of the finderscope with 2-sided adhesive tape. Problem solved. I found a broken pair of 10x25 binoculars with a much better view through them compared to the finderscope. The diameter just fits into the original support of the finderscope so I decided to make a finderscope of my own. I removed the plastic cover, disassembled everything and sanded the aluminum tube. Then I remounted the optical components and made covers from layers of black canson paper for the eyepiece and the objective, since I could not find any plastic at the appropriate size. I did not mind to make a cross hair for centering the target because I prefer to have a clear view through the finderscope. The field of view is about 4.5 degrees. If you get your target within 1 degree it will be enough for the 24mm eyepiece. Making a crosshair is not a big deal. I have repeatedly made/repaired crosshairs on other occasions. This can be done with very thin wire and an instant glue. They are placed after the eyepiece of the viewfinder. and close to it. Now we arrived at the most critical point for a scope : eyepieces. Are they enough? How do they perform? In the case of a 70mm/700mm scope one needs magnifications in the range x20-140. A higher magnification is not so usefull because the resolution is limited from the size of the objective lens anyway. You may magnify but you are not getting any more information from the image. The rule for finding the maximum useful magnification is to multiply the diameter of the objective in mm x2 or in inches x50. 3. A 5mm (140x) or a Barlow Lens x2 to use with the 10mm. The scope included three eyepieces a 20mm, a 12mm both adequate but not optimal and a 4mm (too much distortion and aberrations). I intended to buy a Barlow but the nice people at the shop advised me differently and I am glad I listened to them. I got an 8-24 zoom Celestron wide field which has become my main tool, since it covers the 20mm and 12mm eyepieces with a much better performance. Furthermore it has a 42mm threading so that you can mount a DSLR camera and photo using the "projection" method (see step 13 for discussion on this). Still, I intend to get a 5mm in the future. I found two planoconvex lenses with focal distance 42mm , probably from binoculars and I decided to make a low magnification eyepiece with them. The simplest and probably the most standard design involving only two lenses is the Plossl. This is obtained by placing the convex parts facing each other. The focal distance depends also on the actual distance of the two lenses (see relation). In the case of two identical lenses of 42mm the focal distance is between the limits 21mm < F < 42mm. I selected 34mm which gives a magnification 700/34=20.6x and a large field of view of 146 arcmin=2.43 degrees. This is useful for two reasons a) actually it substitutes the finderscope and b) large open star clusters may fit fully in the frame. For example the Pleiades open cluster in Taurus extends 110 arcmin. The realization of the eyepiece was easy. I used a piece of a 40mm diameter PVC tube, black canson paper for the spacer between the lenses and a film canister which fits nicely in the 1.25" tube of the scope. Using the canister for this purpose is an old trick. The focusing tube moves with the help of a rack and pinion mechanism. Shake it a little with your hand up and down. If it moves then it needs stabilization. I used two pieces of tape underneath parallel to the rack. The pinion is kept in place with a cover and two screws. This should be adjusted so that the tube does not slide. Since I use a camera on the scope, I controlled these two screws in order to hold the camera without sliding. I disassembled and inspected the guiding part very carefully. In summary this is well designed and well made and there is no vibration from this part. The basic 6mm screw which holds everything and terminates in a nylon washer and a nut , should be always tight. This is the only thing one should take constant care of. I also disassembled the two worm gears and removed the excess grease. Then when putting them in place I took care to press the worm gear against the moving part to avoid any "play" of the axis. The moving part is made out of plastic, metal would be better. The legs of the tripod are the main cause of instability. Hanging a weight improves the situation a lot. I have prepared a rope (see photo) that can be set up very fast. I avoided doing any permanent change on the tripod and mounted it through the top hole. If your car is close to the observation site a jug of water is the simplest solution. I have used a plastic bag full of stones or pebbles depending on the location. You may also hang a small backpack or turn the rope around a large stone lying on the ground. There are two advantages from doing this: a) The photo-tripod is more simple and stable and b) I carry it most of the time in the car anyway for the camera. The modification was simple. I used a piece of scrap aluminium plate and substituted the two screws of the dovetail base with new ones terminating on the plate. The handle of my tripod helps me orient the scope with small movements. With a little practice one can regulate this fairly well even in large magnifications. The set contained an orthoscopic tube with a plastic lens in the middle, very low quality. I use an orthoscopic prism unit that goes between the eyepiece and the tube. It is worth having one. The scope is used as a telephoto for the camera. Remove both the eyepiece and the camera lens and mount the camera body directly on the scope. The best method. I use this with my DSLR. You need an eyepiece adaptor for your camera and a T-ring. The image of the scope is "projected" from the scope on the camera sensor. Remove the camera lens and mount the camera body on the eyepiece. The T-ring for my camera has a 42 mm threading and so has my Celestron zoom eyepiece. You gain in magnification this way but the whole set up is heavy for such a light scope and I avoid this combination. I have used it successfully with larger reflective scopes. Aim through the eyepiece with the camera lens on. This method is convenient and the only possibility for compact cameras and mobile phones when you cannot remove the lens (See photo). You can either simply approach the camera to the eyepiece or buy/make a mount. In this case the size of the image depends on the ratio of the focal distances of the eyepiece and the camera lens. This photo was taken with 1/100 sec exposure at ISO 800 (lower than that would be fine). The minimum distinguishable feature in this photo is crater Reinhold b (a black dot close to Reinhold) 26km diameter. It is amazing that one can see this, 400000 km far from here! The viewing angle is (26/400000)*(180 degrees x 60 x 60 / 3.14)= 8arcsec that is, 4 times larger than the theoretical limit of the 70mm objective. Usually one may hesitate to setup the equatorial mount because of the steps it needs. However it is a very basic and useful thing to learn how to do because you can handle the scope better in large magnifications. Bresser has included in the construction helping marks (on the rod and on the main axis) and the procedure is easy. I found very helpful to make an orthogonal triangle with the angle of my altitude location (Athens 38 degrees). I also marked this angle with a small piece of paper tape on the rod which keeps the equatorial plane in position. This saves some time in the dark. If you store your scope in the attic you may think twice before assembling and using it. I have remade the box and I keep the scope and the photo-tripod in a corner of the living room. I use it much more often this way. Details of the construction are shown in the photos. Another reason for preparing a portable setup is that you may have to leave the car and go on feet to the observation point walking for some time. Dividing the load in two bags one for the scope and one for the tripod makes this easier for a company of observers. should be the first necessary steps towards improving a cheap scope. I am an occasional observer and I have access to larger, heavier and more sophisticated scopes of friends. However this small instrument has been to places where its 30kgr big brothers cannot go. Dear Yogavira, thank you for the detailed comment, however, although I was initially confused , it turns out that the photo is correct. You are right to say that the latitude is the angle between the polar axis of the scope and the ground, in my case 38o, but the triangle sets the angle of the base plate of the axis and the ground that is complementary i.e.52o. The metal stick in the photo that holds the base plate is set indeed at the mark of 38o provided by the constructor of the scope. Probably the photo confused you, the scope axis is the part extending to the upper left corner. Anyway thanks for the useful designs and your effort. Mille grazie! Μπράβο φίλε, πολύ καλό άρθρο! Thanks I like those tips very much, especially the stabilizing the mount one! Instead of a weight you can use a couple tent stakes and a bungee cord to anchor your scope to the ground, assuming you're on soft enough ground. i dont know if the instructable OR the comments was the most informative... both are great! I have a newtonian (5") that I got some time ago... I still can not align the primary... Here (MX) its not easy to find a colimating tool... any hints? the exact center of the primary mirror , mark it with tape and align by eye . Fine tuning requires the observation of a star , better Polaris. Wish you luck! I just bought a cheap one and find your instructions very useful, will try with the tripod first. Thx a bunch! If I have two telescopes and one has the smaller lens holder and one has the larger one. Can I swap the smaller lens holder for the larger one? The telescopes I have are both mirror reflectors. One is a 4" the other I believe is a 5? Sorry I can't be more specific as I can't get to either right now as the weather just went bad here and I keep them both in my trailer in my back yard (it is a long way away). I have a picture of the one (I buy a lot of junk at garage sales) I want to put the bigger focusing mechanism on. But no picture of the one I want to pull the focusing mechanism off. They look a lot alike to me except for the diameters. You know the flanges that connect to the tubes, rack and pinion etc. But is there anything that would stop me from doing something like this that I should know about? Mainly I want to change them because I have the lenses for the larger diameter focuser, but not for the smaller one. Thanks. By "lens holder " I think you are referring to the focuser. If you mean can you swap the smaller focuser for the larger one, it is possible, but you would need to make sure that the secondary mirror (the small oval diagonal mirror that reflects the lightpath into the focuser/eyepiece) is large enough to take advantage of the larger eyepiece diameter. I want to swap the bigger one I have lenses for for the smaller one I don't have any lenses for. I'm not sure but the mirror might go with the whole focuser unit. Though the arm it is attached to might be too short, forcing me to modify it. Would be a tricky weld. You are probably referring to the 45 angle secondary mirror. If the focuser is welded on it you should remove the complex and separate it. Probably a Dremmel with a ceramic disc would do depending on the thickness. Otherwise remove the rack and pinion and the internal tube of the focuser and make another support yourself. I do not know the condition of you 4" criterion. However if the two mirrors are not oxidized or scratched you could restore it. The tube can be cleaned. Forget about the tripod. If the mirrors have even the minimum damage then you can forget about it. I'm sure I can find something to cut the little mirror off. The Tasco has an intact tube cap on it so it should be in fairly good shape. The Criterion looks pretty done to me. Maybe if it was the the only scope I had it'd be worth fixing, but it isn't. The tripod will be another issue I need to address. But I figure I'd better get a working scope first before I worry about it. I just remembered I have another telescope and it may even have the right diameter lenses with it. It is complete in the box so I'm not as keen about breaking it apart. Though when I used it I can't say I was too thrilled about it. It is a Meade Jupiter model #60AZ-M I think it has the skinny lenses. I pick a lot of junk up at garage sales. Sometimes I forget what I have. At least I could borrow a lens from that and see what the Tasco is like with it. Can I do that? Of course you can . This Meade is a 60mm refractor. Probably this has the standard 0.965" size eyepieces and as I saw it has a 2 5mm, 12.5mm, 4mm and probably a Barlow 2x. Test them all. If you cannot focus, this will be because the focuser may need to approach the secondary mirror more. Do not expect much in terms of quality but it is a start. Great to know thanks! It might tell me if working on the Tasco is worthwhile or not. I can't remember what I didn't like about the Meade, I think it was at higher magnifications where it really didn't work. A common failing I've read about with low quality equipment. Measuring from the photo the internal diameter of this focuser is probably 0.965", an older size. Do not bother at all to find eyepieces for this, they have lower performance and are harder to find, you cannot set up a collection with this diameter. The standard sizes are 1.25" and 2" reserved mostly for larger catadioptric scopes. So 1.25" is what you should be looking for. Check the eyepieces of the other scope on this. The standard mirror diameters are 4",4.5",5",6",8" and so on. From the photo I deduce that the this scope is about F5 to F6 (ratio of mirror diameter to length). A possible problem when dealing with short F numbers is that when you change the focuser you may need to approach the secondary mirror more in order to focus, that is to move the focuser more into the tube (a few mm). I have met this problem. The solution is to shift the rack lower , or to change/modify the internal tube of the focuser. It can be solved. 1. Compare the image with the same eyepiece (10-12mm, ~100x). Check for diffusion , chromatic distortions in the center of the field for both. Focus and defocus to see which distorts less (usually the larger F). 2. Find the field of view. Select a middle eyepiece 10-12mm , center a star and try to determine when distortions start to appear as the star moves to the edge. The ratio of the two diameters is the FOV number. 80% or larger is good. 3. Try to resolve double stars. A good test is the double-double epsilon in Lyrae (high during summer). It is a pair that can be resolved with binoculars but each of them is a pair distant 2.3 and 2.6 arcsec apart. It is a standard test for telescope evaluation. Your 4" with a 1.2" arcsec limit should be able to resolve this easily. The size of the mirror is not the only criterion. There are also other things to consider, the quality of the mirror coating and the quality of the mounting (tripod or single pilar). Learn to use the equatorial mount. Thry to find the manuals or more information on the specific scopes. Check the "Sky and telescope" for more information for Newtonians. There you ill find how to collimate the mirror , another thing to check. Spend a year or so with the eyepieces you have and there star thinking about better ones.